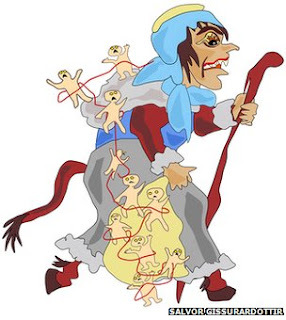 "Her story goes back to pagan times, but in more recent centuries she has become part of Christmas - making the trip down to the towns and cities, searching for naughty children. She returns to her cave with a bag stuffed full of crying youngsters, whom she boils alive and gobbles up." "Until the 19th Century, Sinterklaas did his own dirty work, bringing good children presents, but taking bad ones away in his sack for re-education and a beating. But in 1850, children's author Jan Schenkman drew him with a black servant, who later became known as Zwarte Piet. It is now Zwarte Piet's job to go down the chimney to deliver presents and catch the less fortunate children." 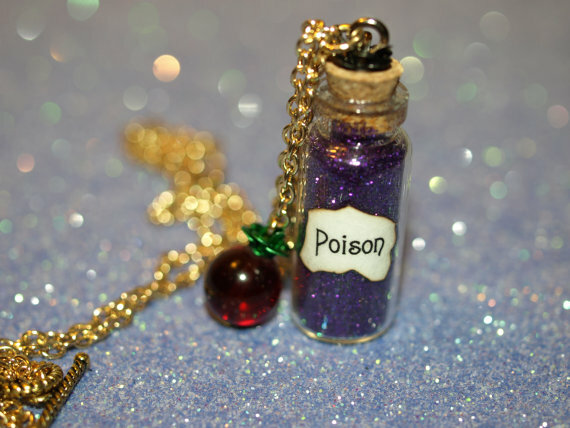 It's a fun, quick read with some surprising information-although maybe less surprising if you're already familiar with the dark side of folklore and how it has become more and more tamed over the years. 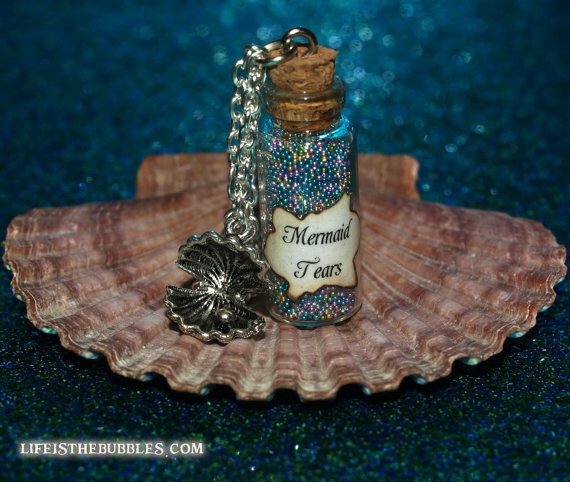 Tales of Faerie is proud to bring you its first ever guest post! I have been an admirer of Spinning Straw Into Gold for a while now; Christie's posts always give me lots of food for thought, and her blog is on my list of regular must-reads. 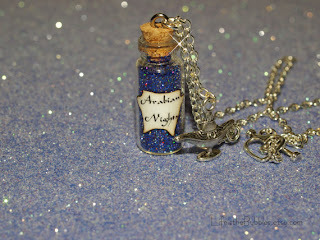 I was absolutely thrilled when she agreed to write a guest post for us here! Please enjoy reading her thoughts on "The Little Match Girl". The Little Match Girl was first told to me by my own grandmother during Christmastime. An exquisitely tragic tale, even beyond what is customary for Hans Christian Anderson, it gripped me with its unusual straightforwardness—almost brutality—in describing suffering, as well as its bittersweet ending. You’re probably familiar with it; if not, do a little detective work here on Tales of Faerie and you’ll find it. As the story goes, a poor little match girl, shoeless in the freezing cold on the eve of the new year, receives three visions when she strikes three matches, each one so real, she is utterly disappointed when the visions vanish into the icy night. 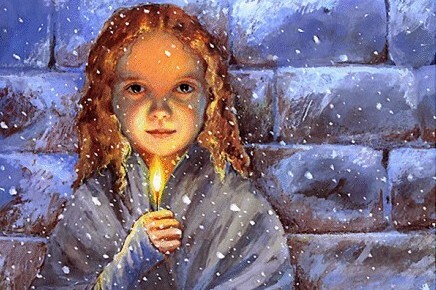 After experiencing, each in their turn, the fulfillment of her earthly needs—sustenance, shelter, and beauty—the little match girl dares to strike a fourth match. In the blaze, her deceased grandmother, the only one who ever been kind to her, appears. The little match girl begs her grandmother not to leave her as the other visions did and strikes all the remaining matches. So the old woman lifts her granddaughter up with her into the light of eternity. The Christian tradition of the beatific vision goes back as far as the Old Testament: the belief that should one witness God in true form, as one speaks face to face with a friend, he should die (think Zeus and Semele, the mother of Dionysus). Another theme very strong in all of Anderson’s work is that of suffering. 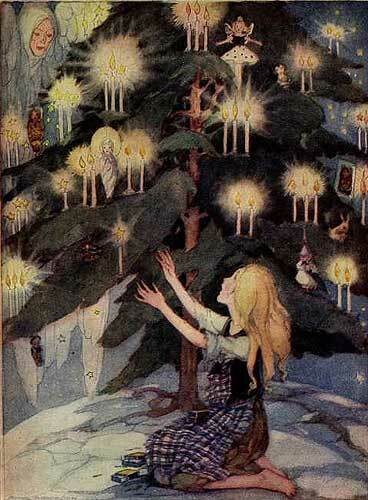 The glorious visions of the little match girl do not come by nothing. Rather, they are granted to one who has endured no small amount of mental and physical anguish. But for the match girl, as for others in Anderson’s tales, suffering is redemptive—that is, it is not useless suffering. The little match girl’s suffering has led her to light the matches and summon her grandmother, an obvious emissary of the divine. And in addition to her own beatification, the child’s frozen body is witnessed the following morning on New Year’s Day, and onlookers and readers alike internalize the puzzle of why the dead little girl smiles so peacefully. The theme has not escaped notice. Composer David Lang won the 2008 Pulitzer Prize for music with The Little Match Girl Passion. In another example, the namesake character of The Little Mermaid experiences the daily passion of the sensation of walking on knives. When she finally sees her beloved find happiness with another, her acceptance of this suffering is transformative. It gives her a lease-to-own soul of sorts, something she wouldn’t have had otherwise. Lastly, the matches lit by the little girl are reminiscent of the four candles of the Advent wreath, each lit during one of the four weeks leading up to Christmas, in anticipation of the solstice holiday (holy day). The candles are symbols to remind observers of the light of the Christ child and the guiding star, the halo of eternity at the end of the earthly journey, and the season of new life to come in spring. The worst is almost over. On the first day of the new year, when we find the tranquil but dead little match girl in the snow, we find also this important truth, which Anderson has presented to us without fancy wrapping paper or softened edges: that suffering is only to be endured for a time. That “the light shines in the darkness, and the darkness has not overcome it” (John 1:5). 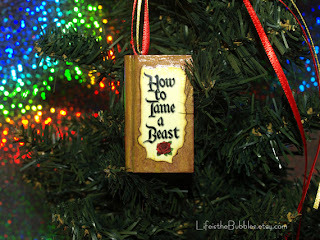 Or perhaps, a word from fairy tale grandfather J.R.R. Tolkien is more fitting: “in the end the Shadow was only a small and passing thing: there was light and high beauty for ever beyond its reach” (The Return of the King, “The Land of Shadow”). 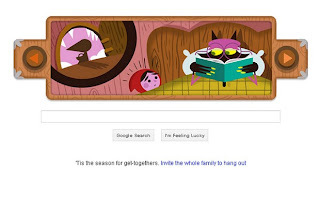 Google tribute to brothers Grimm! Check out the Google Doodle for today, which tells the story of Little Red Riding Hood in honor of the 200th anniversary of the Grimms' first release of Children and Household Tales! Thanks, Jill, for alerting me! 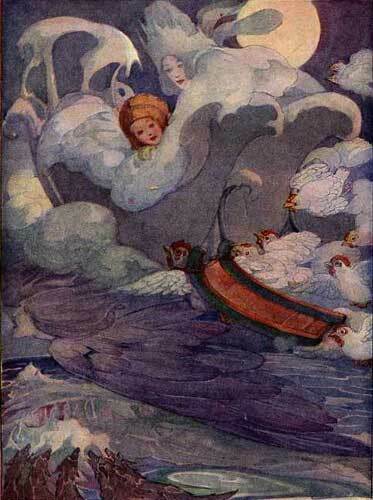 "The snow-flakes grew larger and larger, till at last they looked just like great white fowls. 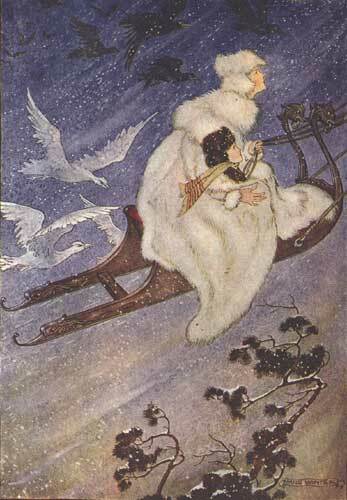 Suddenly they flew on one side; the large sledge stopped, and the person who drove rose up. It was a lady; her cloak and cap were of snow. 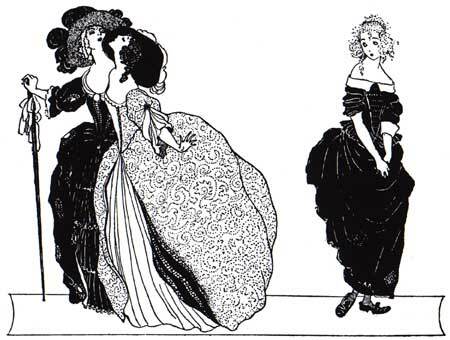 She was tall and of slender figure, and of a dazzling whiteness. It was the Snow Queen. "Are you still cold?" asked she; and then she kissed his forehead. Ah! it was colder than ice; it penetrated to his very heart, which was already almost a frozen lump; it seemed to him as if he were about to die--but a moment more and it was quite congenial to him, and he did not remark the cold that was around him. 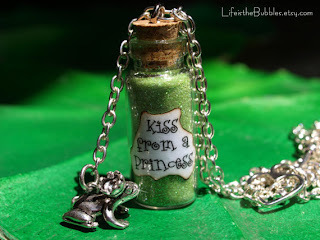 "Now you will have no more kisses," said she, "or else I should kiss you to death!"" "Stop!" said the Lady, and the dwarf pulled the reindeer up so sharply that they almost sat down. Then they recovered themselves and stood champing their bits and blowing. In the frosty air the breath coming out of their nostrils looked like smoke. "And what, pray, are you?" said the Lady, looking hard at Edmund. "I'm-I'm-my name's Edmund," said Edmund rather awkwardly. He did not like the way she looked at him. The Lady frowned. "Is that how you address a Queen?" she asked, looking sterner than ever. "My poor child," she said in quite a different voice, "how cold you look! Come and sit with me here on the sledge and I will put my mantle around you and we will talk." 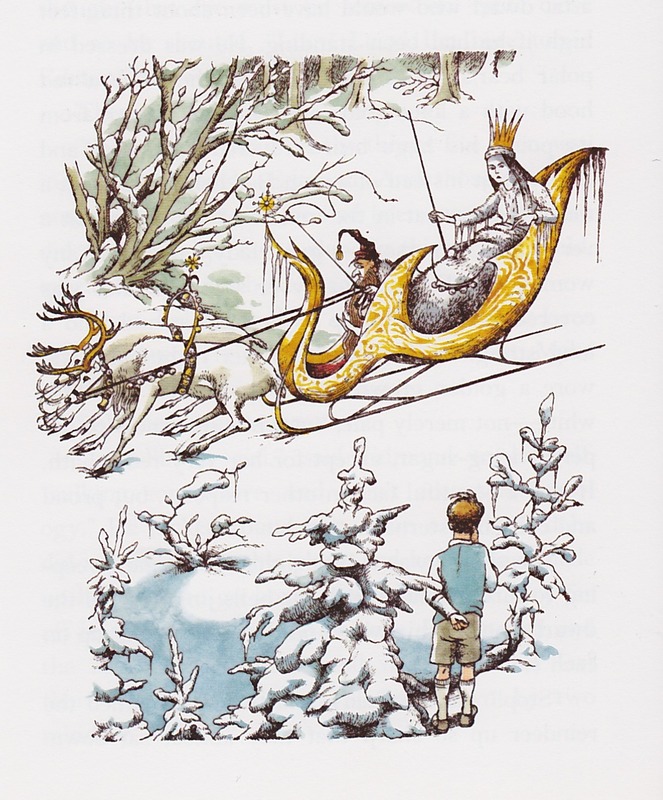 Edmund did not like this arrangement at all but he dared not disobey; he stepped on to the sledge and sat at her feet, and she put a fold of her fur mantle around him and tucked it well in." 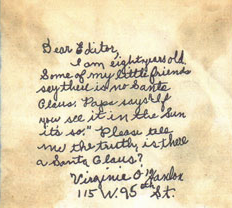 In 1897, a young girl named Virginia O'Hanlon wrote a letter to the New York Sun, asking the editor whether or not there really was a Santa Claus. The now-famous response began "Yes, Virginia, there is a Santa Claus," as Francis Pharcellus Church went on to explain not only that he existed, but why believing in him was such an important thing. Church encouraged his readers to consider what a world would be like without Santa Claus and how dreary that would be: "there would be no childlike faith then, no poetry, no romance to make tolerable this existence. We sohuld have no enjoyment except in sense and sight. The eternal light with which childhood fills the world would be extinguished. Not believe in Santa Claus! You might as well not believe in fairies!" I don't think it's wrong to join in the cultural practices of Santa Claus lore, we did in my family growing up although my parents didn't emphasize the Santa Claus part, and I can't remember a time when I actually believed in Santa Claus, so I realize I'm probably coming from a minority perspective. But I disagree with the idea that if you don't believe in this specific story that there is nothing "to make tolerable this existence." Really? The only thing that makes life worth living is a fat man on the North Pole who gives you whatever you want once a year? That's a pretty pathetic view of life on this earth. I realize Church was probably not so concerned with the particular details of what Santa does on Christmas Eve as the fact that he believes children should believe in wonderous things, which I agree with. But the fact is, there are plenty of wonderful things in this world that really do exist. You can still view the world through a lens of wonder and awe without being naive and believing lies. As we learn more and more about science we see the beauty and mystery of Nature, from the cosmos to the microscopic, and we realize there is so much more to our existence than we can ever comprehend. I find it interesting he compares belief in Santa with belief in fairies, not only because of my interest in fairy tales, but because belief in fairies is not generally encouraged among children the way belief in Santa Claus is. Most children go through some sort of disillusionment when they discover where their presents really come from, although apparently most manage to get over it without ruining trust in their parents, but I'm a big believer in being honest with kids so I'm not sure how I would handle the issue myself. My parents wanted us to experience the joy of giving as well as receiving, which is part of the reason they didn't go to extreme lengths to keep us believing our presents magically appeared every year. I think it's more important to emphasize the real heroes in life-those who spend their lives making the world a better place, those who work and volunteer in charities and schools, firefighters and policemen and women and members of the military-those who risk their lives making our lives safer. You don't have to have a superpower to be a hero, and even if Santa Claus doesn't exist the way the Christmas songs say he does, I do believe in the miraculous. I agree with this quote which is also part of Church's "Yes, Virginia" editorial: "there is a veil covering the unseen world which not the strongest man, nor even the united strength of all the strongest men that ever lived, could tear apart." Sometimes we do get glimpses of what lies beyond the veil. Santa Claus, and fairy tales, can help us imagine what this world could be like, but are only guidelines. Most terribly cold it was; it snowed, and was nearly quite dark, and evening-- the last evening of the year. 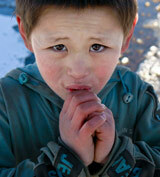 In this cold and darkness there went along the street a poor little girl, bareheaded, and with naked feet. When she left home she had slippers on, it is true; but what was the good of that? They were very large slippers, which her mother had hitherto worn; so large were they; and the poor little thing lost them as she scuffled away across the street, because of two carriages that rolled by dreadfully fast. She crept along trembling with cold and hunger--a very picture of sorrow, the poor little thing! 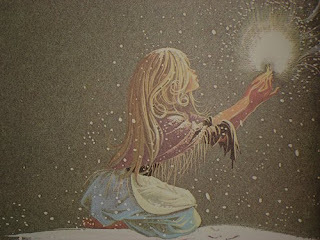 The flakes of snow covered her long fair hair, which fell in beautiful curls around her neck; but of that, of course, she never once now thought. From all the windows the candles were gleaming, and it smelt so deliciously of roast goose, for you know it was New Year's Eve; yes, of that she thought. Her little hands were almost numbed with cold. Oh! a match might afford her a world of comfort, if she only dared take a single one out of the bundle, draw it against the wall, and warm her fingers by it. She drew one out. "Rischt!" how it blazed, how it burnt! It was a warm, bright flame, like a candle, as she held her hands over it: it was a wonderful light. 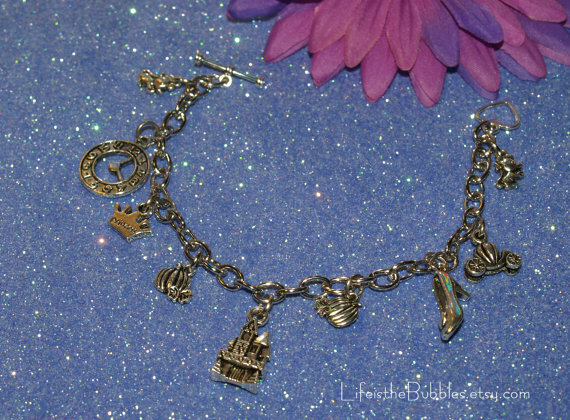 It seemed really to the little maiden as though she were sitting before a large iron stove, with burnished brass feet and a brass ornament at top. The fire burned with such blessed influence; it warmed so delightfully. The little girl had already stretched out her feet to warm them too; but--the small flame went out, the stove vanished: she had only the remains of the burnt-out match in her hand. She rubbed another against the wall: it burned brightly, and where the light fell on the wall, there the wall became transparent like a veil, so that she could see into the room. On the table was spread a snow-white tablecloth; upon it was a splendid porcelain service, and the roast goose was steaming famously with its stuffing of apple and dried plums. And what was still more capital to behold was, the goose hopped down from the dish, reeled about on the floor with knife and fork in its breast, till it came up to the poor little girl; when--the match went out and nothing but the thick, cold, damp wall was left behind. She lighted another match. Now there she was sitting under the most magnificent Christmas tree: it was still larger, and more decorated than the one which she had seen through the glass door in the rich merchant's house. Thousands of lights were burning on the green branches, and gaily-colored pictures, such as she had seen in the shop-windows, looked down upon her. The little maiden stretched out her hands towards them when--the match went out. The lights of the Christmas tree rose higher and higher, she saw them now as stars in heaven; one fell down and formed a long trail of fire. "Someone is just dead!" said the little girl; for her old grandmother, the only person who had loved her, and who was now no more, had told her, that when a star falls, a soul ascends to God. "Grandmother!" cried the little one. "Oh, take me with you! 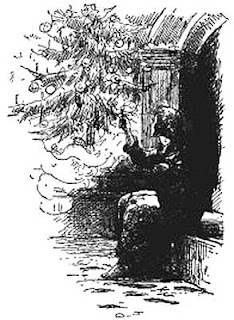 You go away when the match burns out; you vanish like the warm stove, like the delicious roast goose, and like the magnificent Christmas tree!" And she rubbed the whole bundle of matches quickly against the wall, for she wanted to be quite sure of keeping her grandmother near her. And the matches gave such a brilliant light that it was brighter than at noon-day: never formerly had the grandmother been so beautiful and so tall. She took the little maiden, on her arm, and both flew in brightness and in joy so high, so very high, and then above was neither cold, nor hunger, nor anxiety--they were with God. But in the corner, at the cold hour of dawn, sat the poor girl, with rosy cheeks and with a smiling mouth, leaning against the wall--frozen to death on the last evening of the old year. Stiff and stark sat the child there with her matches, of which one bundle had been burnt. "She wanted to warm herself," people said. No one had the slightest suspicion of what beautiful things she had seen; no one even dreamed of the splendor in which, with her grandmother she had entered on the joys of a new year. Full text of Hans Christian Andersen's "The Little Match Girl" was taken from here. It's such a sad tale, but I've always found it to be hauntintly beautiful. From Surlalune's annotations: "New Year's Eve, as mentioned specifically later in the story. 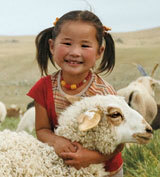 The Christmas and New Year holidays are known for great times of charitable giving. This story has become one of the most popular tales for inspiring charitable donations, especially during the Christmas holidays. It's also a reminder that this little girl, like so many others in poverty, needs help every day of the year, not just Christmas." This is unusual for this blog, but if you want to make a difference this Christmas season beyond obligatory cultural gift exchanging, you could help real children who suffer like the little girl in this tale. You can give a gift or request gifts from the World Vision gift catalogue, giving gifts such as clean water, food, warm clothes, help for sexually exploited girls, and so much more! We talk a lot about issues having to do with fairy tales, such as women's rights and poverty, but I like to think of studying fairy tales as being something that inspires me to make the world a better place, not just a hobby. Although Santa isn't technically a fairy tale, the more I learn the more I'm amazed by the paralells between the evolution of faerie and the evolution of St. Nicholas to Santa Claus. Fairies were once feared and regarded to be unpredictable creatures, who could range from malevolent to merely capricious pranksters, but hardly ever in the history of fairy lore were fairies the beneficient, wish-granting characters they are painted as today, nor were they necessarily miniature and winged. 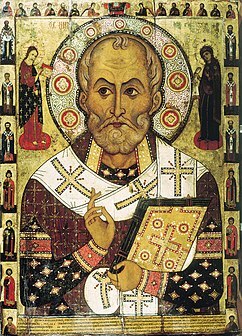 St. Nicholas was not fearsome in the sense that he was evil or unpredictable, but he was held in awe by his followers. According to legends, he not only had the power to predict and prevent disasters, but to restore the innocent to life, as well as take a life as punishment for crime. 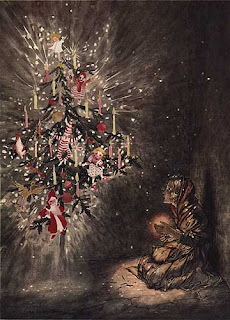 Read my post from last year on the stories of the three girls rescues from prostitution or slavery, which is thought to be the origin of the tradition of hanging stockings, or the story of the three murdered students St. Nicholas brought back to life (which includes gruesome details, much like the fairy tale Robber Bridegroom). 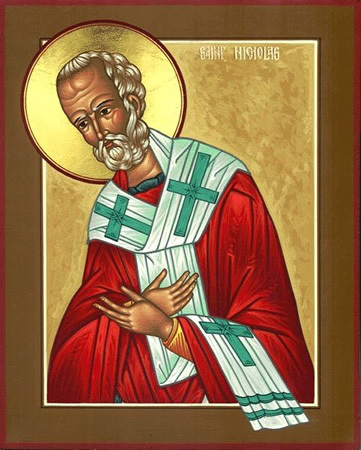 St. Nicholas was also the patron saint of sea travelers, and many stories include him appearing in dreams, or in person (even after his death) to sailors to warn them of storms and redirect them, work with them, even restore a sailor to life who had perished in a storm. Because of the story of the students referenced above, he became the patron saint of students as well. Over time, illustrations and versions of that story created students that were younger and younger, until they became children, and he eventually became the patron saint of children in general. There is also a story of him returning a boy from slavery to his parents on his feast day (today, December 6!) which aided in his image as protector of children. In fact, as stories developed and spread throughout Europe and Russia and parts of Africa, he became the patron saint of practically everyone-from pawnbrokers to vagabonds. He also eventually came to be associated with restoring happiness and wealth, and later into the Giver of Gifts we know him as. St. Nicholas was also associated with stories involving the number three-three generals or three students saved from death, three episodes-a characteristic of folk tales as well. Throughout the Middle Ages, it became common for plays to be performed on his feast day enacting scenes of his life and miracles. Though the plays could get a bit bawdy at times, or light-hearted poking fun at an image usually regarded with supreme reverence, the happy ending justified the rest of the play. Already we see a beginning of a transformation of attitudes-from fear and awe of his earlier worshipers, to a figure of celebration and fun. 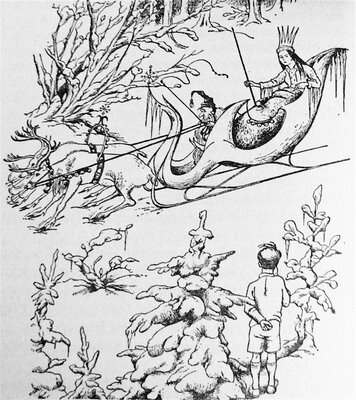 Though there may be some remnants of folklore in the Santa Claus traditions we currently have (the Swedish Jul-Bocken, or Christmas buck, that bore presents, relate to Santa's reindeer, and his fur coat is similar to that of Pelz-Nicol in southern Germany) Santa Claus as we know him is the product of three specific men in New York in the nineteenth century. Washington Irving wrote a spoof history of the Dutch immigrants that included references to St. Nicholas, thus reminding the American population of this once-venerated figure in Europe. Influenced by this, Clement Clarke Moore wrote his famous "A Visit From St. Nicholas" (now more commonly known as "The Night Before Christmas") in 1822. Thomas Nast's illustrations of Santa Claus transformed him from the once thin (literally, thin enough to fit through a chimney) to the rotund figure we see in so many commercials, shopping malls, and storefronts around this time of year. Rather like Charles Perrault did to Cinderella, the elements we now think of as ageless really sprang up due to these three men-building toys in the North Pole, records of good and bad children, receiving and answering children's letters, and driving his reindeer-none of these ideas were associated with Santa previous to New York in the early nineteenth century. To put this in perspective, as Santa Claus was becoming more and more a jolly children's figure, the standard fairy tale versions we know were being created-the Grimm brothers' collection first published in Germany in 1812. The relatively new phenomenon of children's literature was affecting the images of folk tales and saints alike, transforming them into "child-appropriate" in such a way that their earlier histories have become all but erased from present knowledge. What does this history of Santa Claus mean? In the words of Martin Ebon, the versions of Santa Claus reflect the surrounding culture more than anything else, as we adapt our folklore to meet our needs (just like the evolution of fairy tales). Wherever there was a need, St. Nicholas was there to calm fears and instill hopes-from the dangers of the sea, to those of travelling students, to the vulnerability of children in general. "He is what he is today, as Santa Claus, because we yearn for a season of altruism, childlike innocence, and 'Peace on Earth.'" Haven't had too much time to devote to blogging lately, but I can at least share this cute Beauty and the Beast-inspired ornament on etsy while I'm reading up for future posts...the seller from Life is the Bubbles has lots of other Disney/Disneyland inspired products worth checking out too, if Madame Leota's Incantations or Club 33 means anything to you it would be right up your alley. The cruel stepsisters that torment Cinderella are an essential element to the tale, but the way Cinderella reacts to them will vary greatly in different variations of the story (read more about the history of Cinderella variants in Cinderella before Perrault). 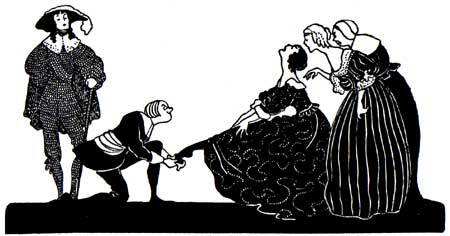 In some versions, such as Perrault's and many modern children's stories, Cinderella is quick to forgive her sisters. 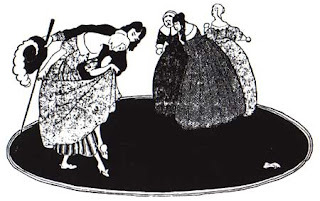 But in others, Maria Tatar points out that the stepsisters are treated even more violently than having their eyes pecked out by doves as in the Grimms' tale. 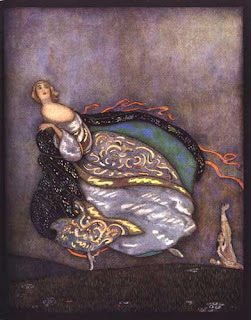 Tatar cites Jane Yolen, who claims that even though Cinderella's reactions vary from culture to culture, and even within the same culture, the happy ending has become increasingly less violent-"the shrewd, resourceful heroine of folktales from ealier centuries has been supplanted by a 'passive princess' waiting for Prince Charming to rescue her." This is true overall, but if Tatar or Yolen is implying that forgiveness is equal to passivity, and that "shrewd, resourceful heroines" prove their worth through vindictive revenge tactics, I would have to disagree. It is secretly pretty satisfying to see the evil characters get what we feel they deserve, but it is much more difficult to forgive someone who has wronged you. Fairy tales may have an oversimplified view of forgiveness due to their short length and direct style, but true forgiveness is not like in a recent American children's book version Tatar quotes where Cinderella naively says, "I'm sure you will never be mean to me again." You can forgive someone while trust is still broken, but I think forgiveness means you are willing to try to build trust again. *Heidi Anne Heiner, or Surlalune's, Cinderella Tales from Around the World is available on Amazon now! I have several books from her series on my Amazon wish list and hopefully I'll be getting lots of new blogging materials for Christmas!